Holy Week has traditionally been a week of a variety of worship services in which we remember much of the things Jesus did and said leading up to his crucifixion and resurrection. But one of the key things he continued to do was heal, feed, and serve people. 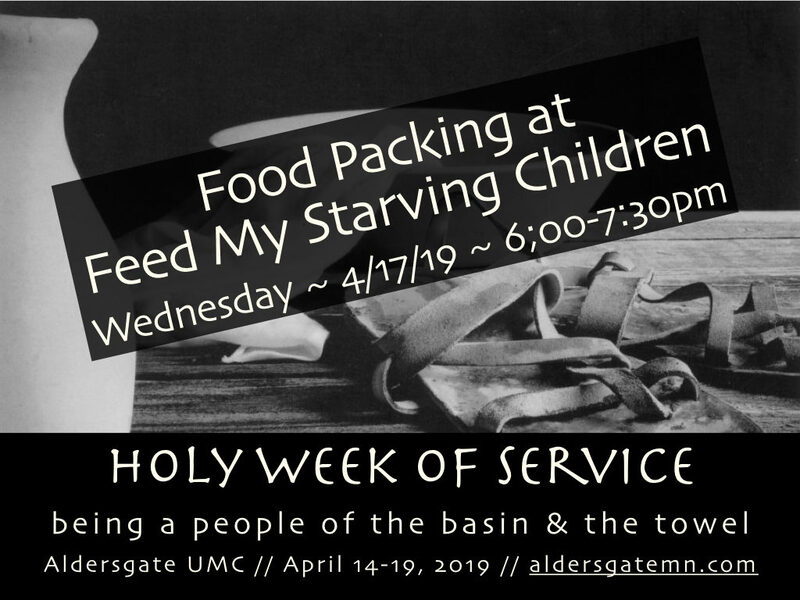 So instead of more worship services (and in particular Maundy Thursday), at Aldersgate Church, we honor Jesus’ work, as well as the heart of the Maundy Thursday service (washing one another’s feet) by setting up a week of service. So find a service project that works for you, or even come up with one of your own. In addition to these projects (weather permitting) our youth group will be strolling through our neighborhood cleaning up remnants from Old Man Winter’s fury! 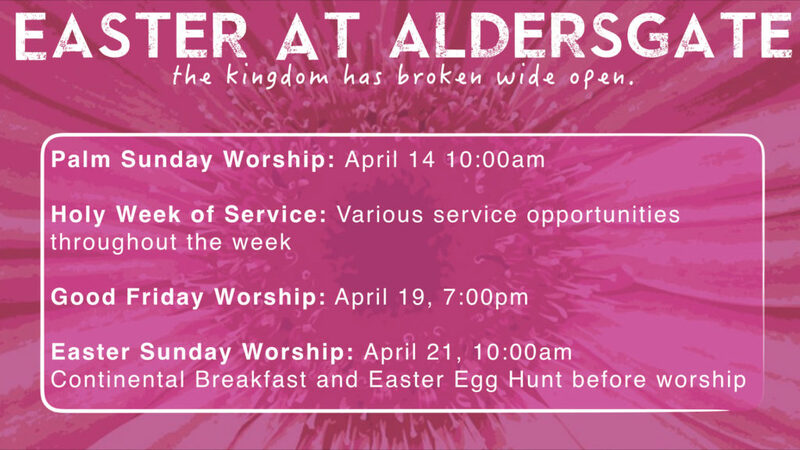 Then join on us for our Good Friday worship service at 7:00pm and Easter worship and celebration on Easter Morning (breakfast from 9:00-10:00am, egg hunt for kids at 9:30am, then worship at 10:00am). Loaves & Fishes, Monday April 15 5:15-7:00pm at St. Gabriel’s Church: Loaves & Fishes is a nonprofit organization serving free, nutritious meals to those in need. We are headed to St. We are headed to St. Gabriel’s Catholic Church on downtown Hopkins to do this. This is a great service opportunity, open to all ages (kids 12 and under need one-on-one adult supervision). Meet at St. Gabriel’s at 5:15 on Monday, April 15th! SIGN UP HERE! Kids Cafe at Perspectives: Kids Cafe is a regular service opportunity at Aldersgate (2nd Fridays), but they had a need during Holy Week so we thought we’d step up. This is a fun and meaningful way to make an authentic connection in our local community. Consider doing what you can to take a couple of hours off of work to serve in this way! Meet at 3:30pm, but you can arrive as late as 5:00pm! SIGN UP HERE! Food packing at Feed My Starving Children: Feed My Starving Children is one of the leading organizations in feeding hungry people throughout the world. This is an easy way to make a real difference. We can take as many people as possible to head out to their packing center in Chanhassen to pack up as many meals as we can to be shipped to hungry people throughout the world! As registrations come in, we will work to coordinate carpools. SIGN UP HERE!